Known as the “King of Terriers,” the Airedale is indeed the largest of all terriers. The dog breed originated in the Aire Valley of Yorkshire, and was created to catch otters and rats in the region between the Aire and Wharfe Rivers. An able sporting dog, he became an ideal working dog as well, proving his worth during World War I. Intelligent, outgoing, and confident, the Airedale possesses a wonderful playful streak that delights his owners. See all Airedale Terrier characteristics below! During World War I, a hardy Airedale Terrier named Jack braved the battlefields to deliver a message to British headquarters. Running through a half-mile of swamp, artillery raining down on him, Jack suffered a shattered leg and broken jaw. Sadly, he passed away soon after he'd completed his mission. Incredibly, the message he was carrying saved his battalion and he was posthumously awarded the Victoria Cross for "Gallantry in the Field." The bravery and courage exhibited by Jack holds true for today's Airedales. Dogs like Jack were bred as a multi-purpose dog who had the keenness of a terrier, but could swim and smell prey. Airedale Terriers have the distinction of being both a sporting and working dog, and today compete in agility, obedience, and hunt tests. Like all terriers, the Airedale has a penchant for digging, chasing, and barking. He is full of energy and makes an excellent jogging companion. Daily walks and romps in the yard are among his favorite activities. You can't talk about the Airedale without mentioning his independent streak. This is an intelligent dog who thinks for himself and does not always wait for direction from his owner. If you want a highly biddable dog that awaits your every command, the Airedale Terrier is not the breed for you. However, if you are stimulated by challenge, living with an Airedale may suit you. It's worth mentioning that the Airedale Terrier is unforgiving of any harsh treatment and will hold a grudge against the aggressor. He can be aggressive to other dogs and animals, and has a strong prey drive, which makes him difficult to handle at times. It is said that the Airedale doesn't start fights — he finishes them. Consistent, positive obedience training is a must, as is a securely fenced yard. Not surprisingly, the Airedale is an excellent watchdog. He will protect his family from intruders with fierce and brave loyalty. However, he is friendly to invited guests in his home. Make no mistake: The Airedale isn't all business — his flipside is comical and playful. He enjoys the company of his family, and he loves romping and playing, tossing toys, stealing dirty socks, grabbing food off the kitchen counter, and just generally creating mischief. He matures slowly, and is often puppyish well into old age. The Airedale is a fascinating breed. He's courageous and athletic, stylish and silly. Many owners say that the only thing better than one Airedale Terrier is two. Like all Terriers, Airedales have a natural inclination for digging (usually in the middle of a beautiful flower garden), chasing small animals, and barking. The Airedale Terrier is an active collector of human memorabilia. He will pick up just about anything (socks, underwear, children's toys) to add to his stash of treasures. Being a high-energy working dog, the Airedale Terrier needs daily exercise. In general, the he remains active and full of energy throughout his life. He is not suited to apartment life, and needs a home with a large, fenced yard. Chewing is another favorite Airedale habit. He will chew anything, and should be left in a crate or secure kennel with sturdy toys when you are away from home. The Airedale is an independent dog, but he enjoys being a member of a family. He is happiest when inside with his owners, and is not meant to be a backyard dog. Airedale Terriers are very good with children and are fondly called reliable babysitters. However, children and dogs should never be left unsupervised. Grooming is necessary, so plan on paying a professional groomer or learn to groom your Airedale yourself. Training and socialization is essential to teach the Airedale proper canine manners. If he is not used to other dogs and people, he can be quarrelsome. The Airedale has the distinction of being the largest of the Terriers. The first attempt at creating the Airedale Terrier, although no one had a blueprint in mind at that time, was in 1853. A Rough-Coated Black and Tan Terrier was bred with an Otterhound in hopes of creating a well-rounded sporting dog that could hunt otters in the rivers and rats on land. The first crossbreeding produced a dog that possessed the keenness of a terrier and was able to swim and scent game. The crosses were called Waterside or Bingley Terriers and within 12 years of the first crossbreeding, the dog had become a popular sporting terrier. 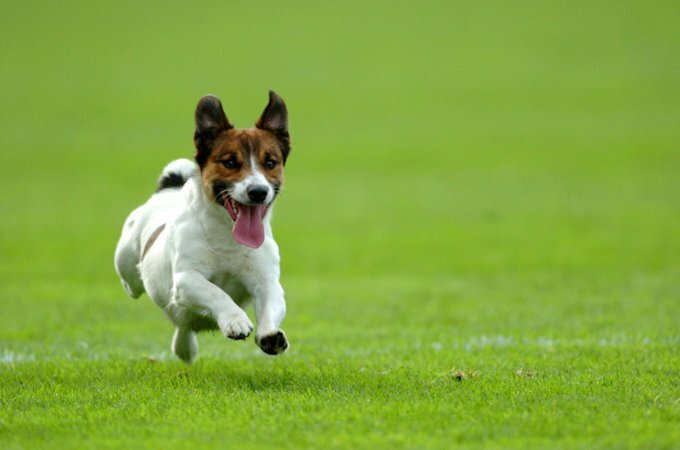 In 1864, the first dog show in the Aire Valley was held and the Waterside Terrier competed under the Broken-Haired Terriers class (the Waterside or Bingley Terrier name was not mentioned until 1879). Author Hugh Dalziel, after judging the dog at a show, went on to describe the Bingley Terrier as "par excellence... an exceedingly good one." His comments brought immediate interest in the breed and a cry of protest from its fans who decried the fact that Dalziel pinpointed Bingley as the breed's birthplace. At this time, a group of fanciers joined together and decided that the Waterside or Bingley Terrier should be renamed the Airedale Terrier. It is believed that the actual name was first suggested by Dr. Gordon Stables, who had judged the dogs a year before Dalziel, but that fact is difficult to validate. In 1880, Dalziel again had the opportunity to judge the Airedale Terrier and referred to the dog as such in his report. The name Airedale Terrier was not accepted or commonly used at first, which generated much confusion. At various shows, classes were made for either one or all three names for the breed and it wasn't until 1886, that the Kennel Club in England accepted Airedale Terrier as the official name of the breed. The Airedale Terrier Club of America was founded in 1900 and, in 1910, the club started a perpetual trophy that is offered at parent club shows. This trophy is known as the Airedale Bowl and has the names of winners' engraved on the bowl and pedestal. Airedale Terriers were used throughout World War I as messengers, sentries, carriers of food and ammunition, scouts, ambulance dogs, ratters, Red Cross casualty dogs, sled dogs, and guard dogs. The war brought stories of the Airedale Terrier's bravery and loyalty and sparked popularity in the breed. Presidents Theodore Roosevelt, Warren Harding, and Calvin Coolidge were among the many people who owned and fancied the breed. 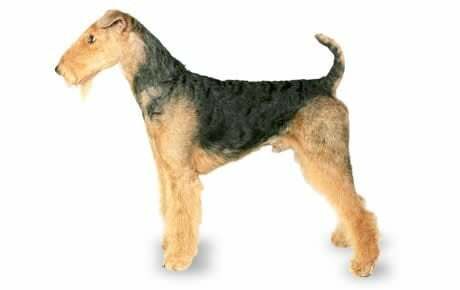 In 1949, the Airedale Terrier was ranked 20th in popularity by the American Kennel Club, but has since dropped in rank. Part of this decline is due to the increased use of German Shepards in roles traditionally filled by Airedales. Males stand 23 inches tall, and weigh about 50 to 65 pounds. Females are slightly shorter, and weigh 40 to 55 pounds. The Airedale is a hard-working, independent, and athletic dog with a lot of drive, energy, and stamina. He is prone to digging, chasing, and barking — behaviors that come naturally to terrier breeds. These traits can be frustrating to owners unfamiliar with the Airedale personality. If you are thinking about an Airedale, consider whether you are willing to live with his propensity toward potentially undesirable behaviors — and whether you want to take on the challenges that go along with his independent nature. If you decide you are, you will be delighted with the Airedale's active, fun-loving, even comical attitude. The Airedale is a lively breed, and he needs plenty of activity. Don't leave him alone for long periods of time, or he is likely to become bored, which leads to the aforementioned destructive behaviors. Keep training interesting and fresh — repetitive exercises will become a bore to the Airedale. He is best motivated by treats and other positive reinforcement methods; drill-and-jerk training methods should be avoided. A reliable watchdog, the Airedale takes pride in protecting his family. He can be a fierce guardian, but is friendly with his family and friends. Ultimately, temperament is affected by a number of factors, including heredity, training, and socialization. Puppies with nice temperaments are curious and playful, willing to approach people and be held by them. Choose the middle-of-the-road puppy, not the one who's beating up his littermates or the one who's hiding in the corner. Like every dog, the Airedale needs early socialization — exposure to many different people, sights, sounds, and experiences — when they're young. Socialization helps ensure that your Airedale puppy grows up to be a well-rounded dog. Airedales are generally healthy, but like all breeds, they're prone to certain health conditions. Not all Airedales will get any or all of these diseases, but it's important to be aware of them if you're considering this breed. In Airedales, you should expect to see health clearances from the Orthopedic Foundation for Animals (OFA) for hip dysplasia (with a score of fair or better), elbow dysplasia, hypothyroidism, and von Willebrand's disease; from Auburn University for thrombopathia; and from the Canine Eye Registry Foundation (CERF) certifying that eyes are normal. You can confirm health clearances by checking the OFA web site (offa.org). Allergies: Allergies are a common ailment in dogs, and the Airdale is no exception. There are three main types of allergies: food allergies, which are treated by eliminating certain foods from the dog's diet; contact allergies, which are caused by a reaction to a topical substance such as bedding, flea powders, dog shampoos, and other chemicals; and inhalant allergies, which are caused by airborne allergens such as pollen, dust, and mildew. Treatment varies according to the cause and may include dietary restrictions, medications, and environmental changes. Hypothyroidism: This is a disorder of the thyroid gland. It's thought to be responsible for conditions such as epilepsy, alopecia (hair loss), obesity, lethargy, hyperpigmentation, pyoderma, and other skin conditions. It is treated with medication and diet. Progressive Retinal Atrophy (PRA): This is a family of eye diseases that involves the gradual deterioration of the retina. Early in the disease, affected dogs become night-blind; they lose sight during the day as the disease progresses. Many affected dogs adapt well to their limited or lost vision, as long as their surroundings remain the same. Umbilica Hernia: Present at birth, this is an affliction in which abdominal fat or internal organs protrude against the abdominal wall near the umbilicus. If the hernia is small, it can be left untreated. Some small hernias spontaneously close by the time the puppy is 6 months old and some dogs live with small hernias their entire lives without difficulty. Large hernias require surgery, which is often done while the dog is spayed or neutered. Surgery is used to prevent a more serious condition in which an intestine loop drops into the hernia causing life threatening strangulation of the intestine. Hemorrhagic Gastroenteritis: This disorder causes vomiting and diarrhea with either fresh or digested blood. This disorder comes on very quickly, and the cause is unknown. Diagnosing is a process of elimination because many other diseases cause similar symptoms. Hemorrhagic gastroenteritis needs prompt medical treatment. Although it run its course within a few days, the dog needs treatment of intravenous fluids to keep hydrated. If the dog becomes dehydrated, his red blood count will continue to rise until the blood becomes thick and slow moving. This can cause another disorder, disseminated intravascular coagulation, and can result in death. The disorder is also treated with antibiotics and anti-ulcer medications. Cancer: Like humans, dogs can develop cancer. There are many different types of cancers, and the success of treatment differs for each individual case. For some forms of cancer, tumors are surgically removed, others are treated with chemotherapy, and some are treated both surgically and medically. The Airedale Terrier is a working dog, and has the energy and stamina that goes with it. He needs regular exercise — at least one walk a day, although two is preferable, coupled with a good romp in the backyard. The Airedale loves to retrieve, play, swim, and goof around. He is a great jogging companion, and in many cases, will tire out his owner. Training and socialization (the process by which puppies or adults dogs learn how to be friendly and get along with other dogs and people) are essential for the Airedale, beginning with puppy classes. Incorporate socialization with training by taking your Airedale with you to many different places — the pet supply store, outdoor events, long walks in busy parks. (Even if you don't imagine many children will be visiting your home, it is important to expose him early to kids of all ages.) Anywhere there are a lot of people to meet and sights to see is a good place to take an Airedale. Crate training is also strongly recommended with the Airedale Terrier. Not only does it aid in housetraining, it also provides him a safe den in which to settle down and relax. In general, Airedales do very well with most training as long as you remember that they have a mind of their own. Ask him to sit or stay in full sunlight in the middle of the summer and it's very likely he'll decide he'd prefer to do so in the shade. Positive reinforcement is the best way to teach an Airedale. If you approach training with a positive, fun attitude, and you have a lot of patience and flexibility, there's an excellent chance you will have freethinking Airedale who is also well trained. Keep your Airedale in good shape by measuring his food and feeding him twice a day rather than leaving food out all the time. If you're unsure whether he's overweight, give him the eye test and the hands-on test. For more on feeding your Airedale, see our guidelines for buying the right food, feeding your puppy, and feeding your adult dog. The handsome coat of the Airedale Terrier has two layers: a topcoat, which is dense and wiry, and an undercoat, which is short and soft. Most Airedales Terriers have a specific coat combination: the majority of the dog is tan (ears, legs, head, underbelly, and occasionally the shoulders) and the back and upper sides are either black or grizzled (black mixed with gray and white). Sometimes there is a speckling of red in the black and a small white star on the chest. The Airedale Terrier is not known for extreme shedding, but he does shed certain times of the year. Regular brushing keeps the coat in good condition (once or twice a week), and periodic bathing as needed (over-bathing is not recommended, as this softens the coarse terrier coat). The family Airedale doesn't have to be trimmed, but most owners do have him groomed by a professional groomer three to four times a year to give him a neat appearance (an untrimmed coat is thick, curly, and unruly). The coat is either trimmed with clippers, by stripping (a process by which the coat is thinned and shortened with a sharp, comb-like tool called a stripping knife), or a combination of both. Paying a professional groomer to groom your Airedale is costly, and should be taken into consideration when selecting this breed. Highly motivated owners can learn how to trim their own dogs, but it's not easy and is time consuming. Brush your Airedale's teeth at least two or three times a week to remove tartar buildup and the bacteria that lurk inside it. Daily brushing is even better if you want to prevent gum disease and bad breath. Begin accustoming your Airedale to being brushed and examined when he's a puppy. Handle his paws frequently — dogs are touchy about their feet — and look inside his mouth. Make grooming a positive experience filled with praise and rewards, and you'll lay the groundwork for easy veterinary exams and other handling when he's an adult. The fun-loving Airedale makes a good family pet. In some cases, he may even become protective of the children in the home, but his large size and high activity level may prove too intense for extremely young kids. The Airedale gets along well with other dogs in his household, as long as he is properly socialized and trained. He can be aggressive, however, with strange dogs that he perceives as threatening. And given the Airedale's reputation as a hunter, he is very likely to chase animals he perceives as prey, including cats, rabbits, gerbils, and hamsters. Airedales are often purchased without any clear understanding of what goes into owning one. There are many Airedales in need of adoption and or fostering. There are a number of rescues that we have not listed. If you don't see a rescue listed for your area, contact the national breed club or a local breed club and they can point you toward an Airedale rescue. Below are breed clubs, organizations, and associations where you can find additional information about the Airedale Terrier.